In a large pot, heat the oil over moderately high heat. Add the garlic, scallions, ginger and pork and cook, stirring to break up the meat until no pink remains, about 3 to 5 minutes. Add the stock and bring to a simmer. Measure out 1/4 cup of the stock and set aside in a small bowl. Add the lily buds, mushrooms, tofu, bamboo shoots, vinegar, soy sauce, sesame oil, pepper and sugar to the pot. Return the soup to a simmer. Stir the cornstarch into the reserved 1/4 cup of stock, then drizzle the mixture into the soup, stirring gently until slightly thickened, about 3 to 4 minutes. 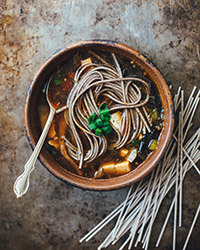 Add the soba noodles and simmer for the amount of time specified in the manufacturer's instructions. Taste and add more of the vinegar and soy sauce if desired. Divide into bowls and garnish with scallions. Serve with chili oil. Steps 1-4 can be made the day before. Cook the soba noodles directly before serving.